When I was a little boy in the little town of Libon in Albay province, I always found myself hanging around the bakery owned by Tío Akon and Tía Buding, a Chinese and Filipina couple, who because of their long friendship with our family somehow became a “relative” of sorts. Their daughter they fondly call “Ying” became my closest of friends up until these days. When Tío Akon passed on, his wife Tía Buding, continued running the bakery until the day she thought she was tired and too old to be a baker. Well, just by hanging around the bakery, I had learned so many things about baking. In those days, the bakery had a huge firewood-heated oven (they called “horno,” also the Spanish word for oven) that still exists in our backyard now after the old bakery building was demolished. I had learned to differentiate the texture and feel of the various breads that small bakery baked each and every day – pan de sal (the centerpiece of any bakery), ensaïmada (originally from Mallorca in Spain), pan Americano (now known as “tasty”) or loaf bread, pan de agua, bonete and many others. When I got an invitation to a press do for a “Bakery Fair” recently, it got me a little worked up, recalling the days and nights I would smell the scent of baked bread from the chimney of the neighborhood bakery. Held only every two years, the country’s biggest and most exciting “Bakery Fair” is a fitting post-Valentine event at the World Trade Center on Feb. 15 to 17. One of its many highlights is the Cakes Competition with 63 talented bakers as participants. “Bakery Fair 2019” will open with the ceremonial cutting of giant seven-foot special cake celebrating the theme this year—Chinese New Year in the Year of the Pig. The Filipino Chinese Bakery Association, Inc. (FCBAI) who believes that this theme is a fitting celebration of good luck and good life as the Chinese New Year officially starts on Feb. 5 is organizing the fair. Award-winning cake designer James Anton Uy of Cupcakes Bakery created the cake that is topped by a Chinese mascot representing the Chinese Year of the Pig. 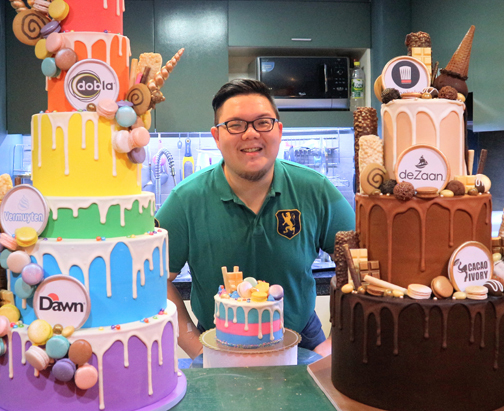 Uy is a respected baking and cake decorating instructor and the 2013 Winner of Bakery Fair Cake Display competition where he bested even some of the more established names in the local baking industry. He is a contributor for the internationally known Satin Ice (Satinice.com) for Cake Design Inspirations as well as in various local magazines like Wedding Essentials, Wedding Digest and Real Brides Magazine. The three-day Bakery Fair is a brainchild of FCBAI and features exhibitors, seminars and demonstrations by local and international experts. All kinds of modern baking supply and equipment will be showcased. Going to the US and becoming a US citizen, for many Filipinos, are the sweetest dreams that continually motivate them to apply either for a tourist visa or finding an employer so they can eventually change their status from visitors to permanent residents and then US citizenship. Recently, we had dinner with a group from the US that told us about the quickest way to get a an immigrant visa not only for ourselves for out entire families. They talked to us about “Investment visa” or EB-5, which is considered the fastest option in acquiring permanent residence status. The group’s spokesman said, it has no quota backlogs, in the United States. What does it offer to applicants or future visa holders? It offers holders, including family members (spouse and unmarried children below 21), freedom to study, work, and live in the US without additional immigration requirements. Explaining further, the group said that the US Congress created the EB-5 Program in 1990 under the United States Immigration and Citizenship Services (USCIS) in order to stimulate the US economy through job creation and capital investment by foreign investors. An ideal window to acquire the EB-5 visa is being offered by New York-based Lightstone Investments to interested parties. All it takes is a minimum investment of $500,000 with an eye in opening up job opportunities for those residing in the United States. Lightstone is one of the largest privately held real estate companies in the United States with $6 billion in assets under management and development. The company is headquartered in New York City and has holdings in 28 states. It owns over 15,000 apartments throughout the US. Over $1.6 billion has been invested by more than 18,000 investors in real estate investment funds managed by Lightstone. Nicolai Hinrichsen (you can google him for verification) is a senior attorney with Mayer LLP and Managing Partner of its Asia EB-5 practice. He has over a decade of experience in EB-5 immigration. He represents individual investors in obtaining permanent resident status through either regional center or direct EB-5 investments. He was recently recognized by EB-5 Investor Magazine as one of the top 25 legal professionals in the field. So, isn’t your dream for you to be permanent US resident, or be an American citizen? Visit www.isah.red for more stories. Follow me on Facebook (@isahvr), Twitter (@isahvred) and Instagram (@isahvred).